Many drivers have a clear recollection of the Eclipse sports coupe that was popular in the 90s. This model was discontinued in 2011, but it was known for its impressive style and exceptional performance on the road. The Eclipse name is making a comeback as a sporty compact SUV that is new to the marketplace this year. 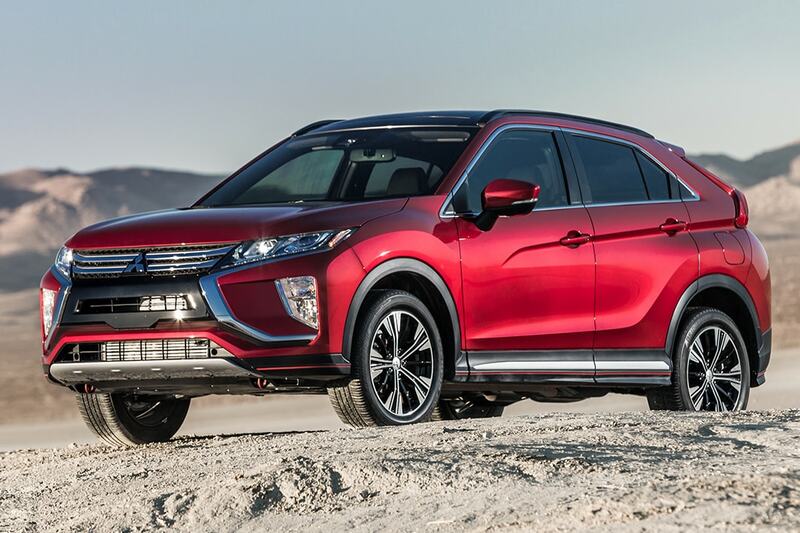 The 2018 Mitsubishi Eclipse Cross is one of the most well-equipped vehicles in the Mitsubishi lineup currently, and it offers substantial benefits in comparison to other small SUVs in its class. If you are looking for an eye-catching SUV that will pamper you with its incredible features, visiting your local Thornton dealership to check this vehicle out in person is a smart idea. At Skyline Mitsubishi, you can test drive the Eclipse Cross, and you can get any questions answered about the different trims from a knowledgeable salesperson. While the exterior design of this 2018 SUV is stunning, the area that really makes it stand apart from the competition is the interior. Depending on the trim level, the seats are either premium cloth or leather, and the standard interior color for all trim levels is black. The interior is accentuated by an attractive instrumentation panel, heated side mirrors, a seven-inch infotainment feature, one-touch power windows and power door locks. A USB connection, a great sound system, climate control, turn signals in the side mirrors, interior air filtration, electric power seating, cup holders in the front and rear and numerous storage compartments are standard equipment in all of the trim levels. The 2018 Mitsubishi Eclipse Cross also has enhanced interior features available in select trim levels, and these higher-level features include cruise control or adaptive cruise control, audio and cruise functions on the steering wheel, heated and power adjustable front seats, keyless ignition, a multi-view camera, a heated steering wheel, a universal remote transmitter and other features. Test driving this small and stylish SUV in Thornton Colorado gives you a chance to learn more about the features available in each of the trim levels for 2018. When you visit your Thornton dealership to check out the Eclipse Cross in person, you may be drawn to the bold exterior. Fitting to the reputation of the Eclipse sports coupe from many years ago, the new SUV carrying its name has a unique exterior design that is both bold and sporty. A powerful grille and angular side windows enhance the exterior style. Five classic color options are available in this year's model, and you can admire these colors in person at your Thornton dealership during your test drive. The lower trim levels come with 16 x 6.5-inch alloy wheels, and the higher trim levels are equipped with 18 x 7-inch painted alloy wheels. All-season tires are standard, and some of the exterior options include a sunroof, front and rear mudguards, a chrome package, a garnish package and more. Drivers in Thornton Colorado can easily customize this small SUV as desired with so many upgrades available. When you test drive this sporty compact SUV at Skyline Mitsubishi, you will be able to look under the hood and experience its capable performance for yourself. The 2018 model is equipped with a continuously variable automatic transmission. Some trims have a front-wheel drive drivetrain, and others have an all-wheel drive configuration. To ensure that you have a comfortable ride in Thornton Colorado and beyond, this sport utility vehicle also is loaded with a four-wheel independent suspension system, a front and rear stabilizing feature and traction control. Mitsubishi is known for manufacturing exceptional vehicles that perform well on the road, and the new Eclipse Cross lives up to the manufacturer's reputation. All trim levels are equipped with the same base engine. This is a turbocharged, gas-powered, inline four-cylinder, 1.5-liter engine with variable valve timing. The standard performance ratings for this base-level engine include 152 horsepower and 184 foot-pounds registered for torque. When you test drive this SUV, you will notice that it performs remarkably well with substantial power and excellent handling. 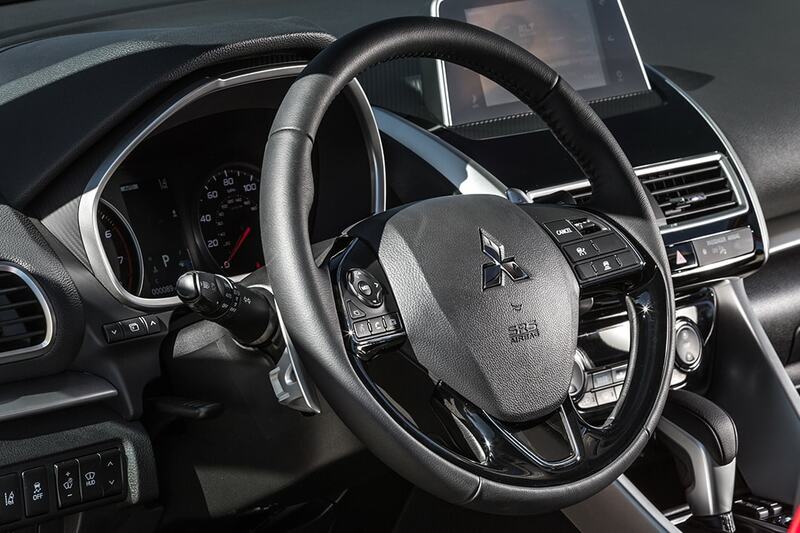 Safety is an important factor for most buyers, and Mitsubishi does not let you down in this area. The 2018 Mitsubishi Eclipse Cross has a full range of standard safety features loaded into all trim levels. This includes a tire pressure monitoring sensor, front and rear head airbags, side-mounted airbags, a deactivating sensor for the front passenger airbag, adjustable headrests for all of the vehicle occupants, daytime running lights, child seat anchors, rear row child safety door locks, fog lights, four-wheel ABS and more. There are also upgraded safety features available with superior trim levels. These are LED headlamps, pre- and post-collision safety warning features, dusk sensing headlights, a blind spot warning feature and a lane departure warning alert. At Skyline Mitsubishi, we carry a huge selection of trims for this popular new SUV in stock and ready for you to review in person. Our helpful sales team will take the time to answer all of your questions about our small SUV lineup so that you can make an informed buying decision in a no-pressure environment. If you have decided that this SUV is right for you or if you are still on the fence, now is a great time to contact us. You can reach out to use via our website or by phone, or you can stop by our dealership in person at your convenience.